Hosted by and in conjunction with the Korea Centers for Disease Control and Prevention, National Institute of Health, the International Human Epigenome Consortium organized its annual IHEC meeting in Seoul, South Korea, from September 6-8, 2012. Quite a number of BLUEPRINT partners attended the meeting. For epigenetics researchers from all over the world it was definitely the right place to be: the third annual meeting of the International Human Epigenome Consortium (IHEC) in Seoul. The Korea National Institute of Health did a great job ensuring a smooth conference organization. The first speaker to enter the IHEC stage was Chemin Rim, the Korea Minister of Health and Welfare. His Congratulation Address was particularly appreciated by the IHEC Members and made for a successful start of the meeting. Scientists and funders alike used the opportunity to discuss the state-of-the-art as well as the future course of international epigenomics research. The first day was dedicated to the Member and Workgroup Updates. Besides exchanging ideas on structural and developmental matters, the IHEC Members took a glimpse into the future of epigenetics. The Scientific Sessions of the second day provided room for detailed scientific discourse related to IHEC’s grand goal of deciphering 1000 epigenomes, and ultimately having an impact on human health. 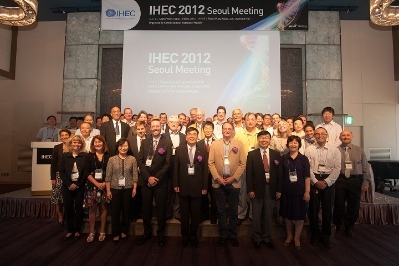 "This year's conference was a great success", reports Eric Marcotte, chair of the IHEC Executive Committee. "The IHEC Members are looking forward to a very promising year in epigenomics research and to the next annual conference in Berlin – a challenge that our German colleagues are happy to meet."